Oval vase with a reproduction of drawings by Gio Ponti, beginning of 20th century. 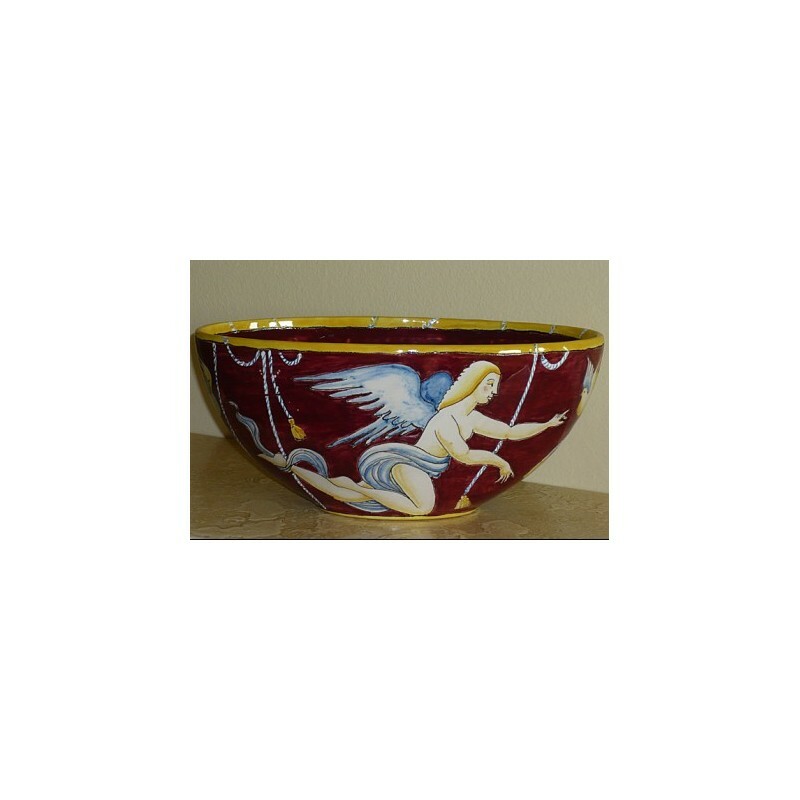 This object is rigorously and skilfully hand made and painted by Master Craftsmen from Montelupo, therefore it appears unique in its details. Montelupo is a town situated on the left bank of the river Arno, not very far from Florence, rich of art and history, witness of a flourishing and precious production of art ceramics for more than seven centuries. 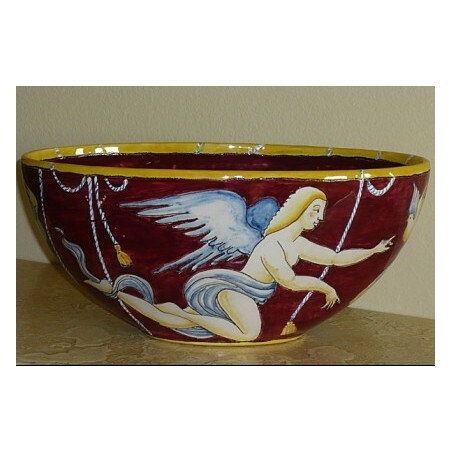 Ceramics tradition in Montelupo dates back to the second half of XIII century, when the first “archaic maiolica” were produced, characterized by decorations similar to glazed ceramics of Catalunya, Provence and Balearics. By the end of 1300, master potters of Montelupo introduced new white misture allowing a better glazing of the “biscuit”, giving majolica a brighter and more brilliant surface. The development of commerce for Montelupo ceramics started from XV century: Montelupo, being along the river Arno, could be quickly connected to International trade thanks to the ability of “navicellai” carrying goods to the harbours of Livorno and Pisa; from here Florence traders sent out ceramics between the Tyrrhenian and Spanish coasts. Between 1450 and 1530 production of ceramics in Montelupo had its greatest development time, thanks to the important orders by the noblest Tuscan families as Medici, Strozzi, Machiavelli, Frescobaldi and Pucci. In this period also new decoration techniques were developed, influenced by the wide repertoire of Spanish majolica of Arab tradition. Renaissance and economic development in Florence increate the importance of Montelupo Master potters, and this was the time of the finest processing and an evolution in the representation of subjects, inspired by plants, animals and the coats of arms of noble Tuscan families. Today Montelupo è an unquestioned capital of ceramics, not only in Tuscany. Many ceramics work from Montelupo are displayed in the most important museums in the world, from Victoria and Albert in London to the New York Metropolitan. The history of Montelupo ceramics is now represented in the Museum of Ceramics situated in the Tuscan town and occupying a surface of over 2000 mq.